Home / News and Updates / Should you use Gutenberg or stay with the Classic editor? The WordPress market and community is large to say the least. But one thing that I was wonder, is how many WordPress users know about the new Gutenberg editor? Realistically most are not aware of it, and when WordPress 5 comes out, it might be a shock. Just like many do not know about the controversy behind Gutenberg and how it will impact their website. Talking about Gutenberg and everything that it does is a very long topic, so I will keep it short. I’m here to give my own opinion on whether or not you should switch to Gutenberg or stay with the classic editor. However, if you want more indepth information, you can read more about Gutenberg on the WordPress website. I should mention that I’ve used Gutenberg for the last few weeks, so I have a pretty good idea of the pros and cons. Despite what some people are saying, Gutenberg is not really an editor, it’s more of a page builder. 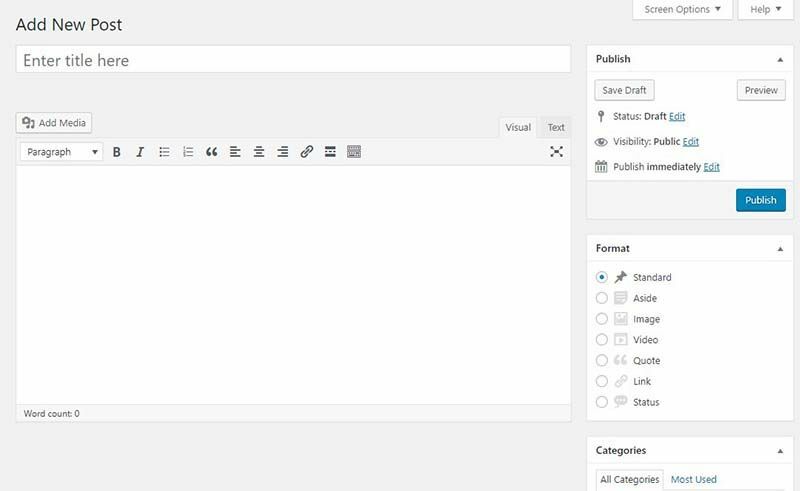 The idea is to replace the classic editor with the new Gutenberg editor as your method to create content. How you create posts and layout your page is going to drastically change visually and with functionality. Anyone who is comfortable with the classic editor will probably find it disruptive, confusing, and scattered. I agree because there is a lot of truth to this. However, if you are new to Gutenberg, you will more likely take in stride as though the editor has always been like this. But to sum up the Gutenberg editor, it’s a page builder that uses blocks to create content. Every element such as paragraphs, images, lists, tables, and more, are all handled by adding blocks into your page. I had to laugh when he said that because right now everything about Gutenberg seems like chaos. Yes, the classic editor for WordPress is based on TinyMCE and has been part of WordPress for a very long time. Though it’s not perfect and needed a serious overhaul, it appears this won’t happen because Gutenberg is replacing it. As you can see, this is familiar to everyone and it shows that everything is in view and within reach, but as I said, all this is going to change. Again, some will like it and some will hate it. I don’t know about you, but I do not like having a messy source code. Switched back to the classic editor, I discovered a LOT of empty paragraph tags were left behind with comments <!– wp:paragraph –> included. The screenshot shows just a portion of what was left behind, there were other types of blocks that left code behind. If you used image blocks, you will also find that Gutenberg classes <figure class="wp-block-image tutorials"> remained as well. This could result in unstyled images if your theme does not maintain the styling for blocks. It’s not just images, it’s other blocks as well. Don’t install Gutenberg on your “live” website because it’s still in beta. This means it’s still in development and bugs (a lot of them) still exist. Try Gutenberg on a staging (development test site) first. Get yourself familiar with it by creating pages and posts. Try all the blocks and other functions associated with Gutenberg. Make notes on what you like and don’t like. Use this as one of your deciding factors when you choose which editor is right for you. Give it a week of usage to get a better feel for it and know where everything is. Make note of every plugin and the theme you are using for your website. Contact each of their respective developers and find out if Gutenberg is support—or will be. The success of the Gutenberg editor will be 100% dependent on you, the end-user. If you are happy with it, then it’s a success for you. Otherwise, if this new editor is not something you want to use, you have the choice to stay with the classic editor. If you want a fallback editor, or perhaps you simply want to keep using the classic editor, I recommend you install the plugin for it. The reason for this is because when WordPress 5 comes out, it’s my understanding that the classic editor is not going to exist in it. However, you can install the Classic Editor plugin to prepare yourself when WordPress 5 with Gutenberg as the default editor goes live. Slower Content Creation – I create a lot of content, including theme setup tutorials that have a mix of various content and media. I find that writing an article takes about 30% more time and effort. Missing Format Elements – With the content I create, there are a lot of formatting elements I need in an editor, but Gutenberg falls short of inclusion. For example, colour a single word; superscript, adding special characters…etc. Actually, to be fair, even the classic editor does not offer what I need; running the site on the Joomla CMS, the editor definitely reigns supreme! Complicated Editor Styling – Styling blocks for the editor is a lot more difficult because for many blocks, you are having to customize the containers of the editor, not the actual content part. Not Ready for Prime-Time – Gutenberg right now is not ready for primetime; fair enough that it’s in beta right now and still under development with many bugs and constant style changes by the development team. This might be a different story once Gutenberg is officially released. Layout – The user interface for Gutenberg makes it hard to find things because they hide elements which requires a lot more looking and mouse clicking. I personally like to see what I need instantly in front of me. Everything with Gutenberg is spread out which makes it harder to create, especially when working in a large resolution display and window. 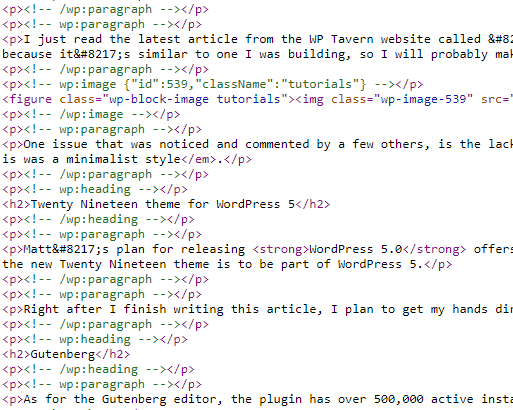 Although I listed out the reasons why the Gutenberg editor is not for me, it good be for others. The only way you will know for yourself is to try it out on a test site and play with it for a while, preferably a week. Again, what doesn’t work for me may work for you. Some people may opt in to use full-on page builders, like Elementor, or any of the other ones out there. Of course, once you start using these popular page builders, you are basically locked in forever and must keep using them. Of course, this is a whole other topic. If I Don’t Like Gutenberg, Why Create Themes for it? I’m sure some of you reading this article are asking that question. Why am I creating WordPress themes for Gutenberg if I don’t like it? Easy answer because the world of WordPress is about to change with Gutenberg and with the millions of websites on the internet, many will be seeking out themes that support it. As developers, it’s important to adapt and to make sure everyone has a theme or plugin that works with Gutenberg. Our job is to make that happen. So if you decide to stay with the classic editor, you won’t have to worry about our themes because they are built for both editors. I think most will feel that way, at least for a period of time while Gutenberg becomes more of a stable environment. Everyone who is accustom to the classic editor will feel overwhelmed with the new editor, especially if they have a lot of posts or write lots of posts. From what I have read on other site blogs, is that there definitely are people who won’t upgrade to version 5 of WordPress once it’s released. I’ve been testing v5 our for the last couple of weeks now because as a developer, I need to keep up with the times. However, for my themes, both current and new releases, I will maintain 100% compatibility for the classic editor, and even for the forked version of WordPress known as ClassicPress–no Gutenberg in that one. However, it will be interesting to see where things are once WordPress 5 comes out and when Gutenberg is officially released.